Homicide rate per 100,000 population — N.L. Homicide rate per 100,000 population — P.E.I. Homicide rate per 100,000 population — N.S. 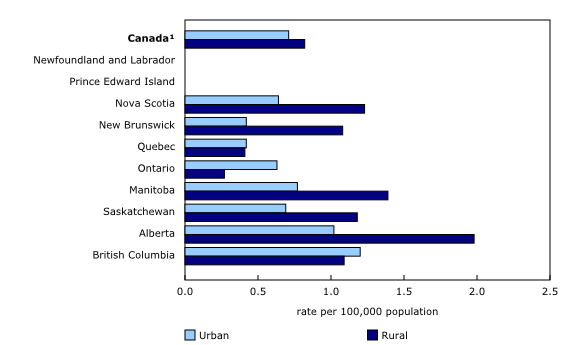 Homicide rate per 100,000 population — N.B. Homicide rate per 100,000 population — Que. Homicide rate per 100,000 population — Ont. Homicide rate per 100,000 population — Man. Homicide rate per 100,000 population — Sask. Homicide rate per 100,000 population — Alta. Homicide rate per 100,000 population — B.C. Homicide rate per 100,000 population — Y.T. 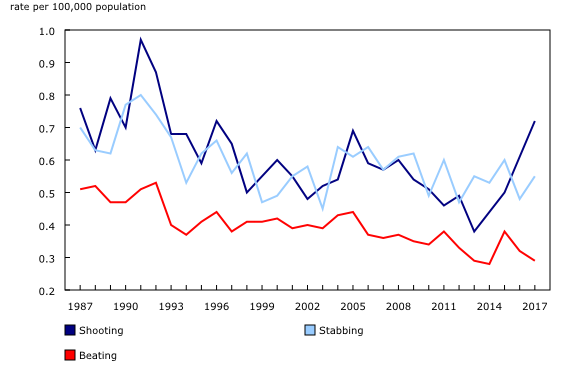 Homicide rate per 100,000 population — N.W.T. Homicide rate per 100,000 population — Nvt. Homicide in Canada hit its highest rate in almost a decade in 2017. Much of the increase was the result of more firearm-related and gang-related incidents. The firearm-related homicide rate increased 18% from 2016 to 0.72 per 100,000 population—the highest rate since 1992. Police reported 660 homicide victims in Canada in 2017, 48 more than in 2016. The homicide rate rose 7% in 2017 to 1.80 victims per 100,000 population—the highest level since 2009. While homicide continues to be a relatively rare occurrence in Canada, representing less than 0.2% of all police-reported violent Criminal Code offences in 2017, homicide rates are considered benchmarks for levels of violent activity both in Canada and internationally. 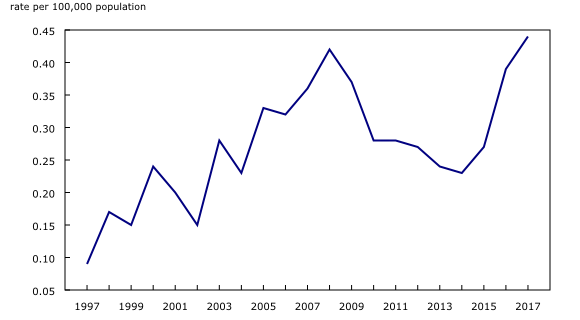 Homicide is not the only violent criminal offence in Canada to increase since 2016. Rates for other serious violent offences, including attempted murder (+4%), sexual assault (+13%), robbery (+2%) and aggravated assault (+1%), were up in 2017. Firearm offences and the presence of firearms in violent crimes have also increased in recent years. 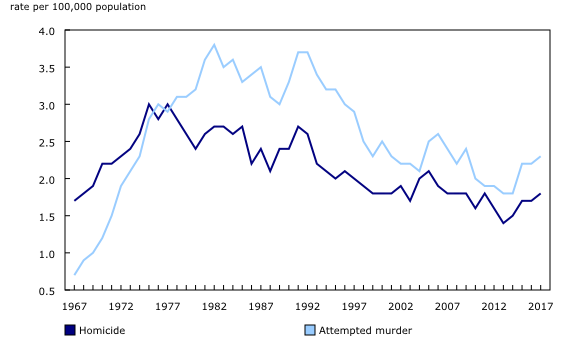 Despite year-over-year fluctuations, Canada's homicide rate has generally declined over the last few decades. The rate of homicides in 2017 was 41% lower than the peak in 1975 (excludes the 329 victims killed in the Air India incident that occurred in 1985). More recently, however, the rate has increased slightly, and was 7% higher than the previous 10-year average in 2017. As in Canada, the homicide rate in the United States, which is typically higher than Canada's, has been on an upward trend since 2013. This trend has not, however, been observed in other countries such as the United Kingdom, France and Australia. Detailed information on homicide in Canada is provided in the accompanying Juristat article released today, "Homicide in Canada, 2017," and the "Infographic: Homicide in Canada, 2017." In 2017, two provinces drove the national increase in homicides: British Columbia with 118 victims, up 30 from 2016, and Quebec, which reported 93 victims, up 26. With 2.45 homicides per 100,000 population, the homicide rate in British Columbia was up 32%, making it the province's highest rate since 2009. This increase occurred in both urban and rural areas and can be partly explained by more gang- and firearm-related homicides. The increase in Quebec was mostly due to more homicides occurring in rural areas and a higher number of victims in firearm-related incidents in the census metropolitan area (CMA) of Québec. The increase in firearm-related homicides was the result of the mass shooting that occurred at the Islamic Cultural Centre of Québec in January 2017. This incident accounted for six of the eight firearm-related homicides province-wide. Despite this increase, Quebec's homicide rate (1.11 per 100,000 population) ranked second-lowest among the nine provinces that reported at least one homicide. Crime and policing in rural areas have been a recent focus of concern in Canada. In 2017, police services reported 148 victims of homicide in rural areas of Canada, 36 more than in 2016. This represented 22% of all homicides nationwide, even though people living in rural areas accounted for 16% of the Canadian population. The homicide rate was 45% higher in rural areas (2.43 per 100,000 population) than in Canada's urban areas (1.67 per 100,000 population). While the rate rose in both urban and rural areas in 2017, rural areas recorded a 31% increase, compared with a 1% rise in urban areas. For both urban and rural areas, homicide rates were higher in the territories and the northern regions of the provinces. In 2017, police reported 422 homicide victims in Canada's CMAs, 4 more than in 2016. Despite the increase, the homicide rate in CMAs fell 1% from the previous year to 1.63 per 100,000 population, due to an increase in population. While there was little change in the overall number of homicide victims in CMAs, there were variations within the CMAs themselves, with Vancouver (+11 victims) and Québec (+9 victims) reporting the largest annual increases. Vancouver reported 52 homicide victims in 2017, its highest number since 2009. A rise in firearm-related incidents contributed to the increase. Overall, 48% of victims in Vancouver were killed by a firearm compared with 44% in 2016, representing an increase of 7 victims. Most firearm-related homicide victims (68%) in Vancouver were killed with a handgun. The increase in Québec was the result of the January 2017 mass shooting that occurred at the Islamic Cultural Centre of Québec. After declining 37% from 2009 to 2014, the gang-related homicide rate rose for a third consecutive year in 2017. Overall, there were 0.44 gang-related homicides per 100,000 population, the highest rate since comparable data became available in 2005. In 2017, police reported 163 gang-related homicides, 23 more than in 2016. These represented one-quarter (25%) of all homicides. The overall rise in gang-related homicides from 2016 to 2017 was mainly the result of large increases in British Columbia (+15 victims) and Alberta (+12). Together, these two provinces accounted for almost half (47%) of all gang-related homicides in Canada. In 2017, there were 266 firearm-related homicides reported in Canada, 43 more than in 2016. Handguns accounted for about 6 in 10 firearm homicides in 2017. Prior to 1990, rifles or shotguns were used far more frequently than handguns. However, a shift toward an increased use of handguns can be seen starting in the early 1990s. Firearm-related homicides have been rising since 2014, and gang-related violence has been the primary driver. The proportion of gang-related homicides committed with a firearm has been steadily increasing since 2015. Gang-related homicides committed with a firearm represented 12% of all homicides in 2015. By 2017, this proportion had grown to 21%. As with homicide rates in general, the highest rates of homicides involving a firearm were reported in the western provinces. Alberta (1.19 per 100,000 population) and British Columbia (1.18) recorded the highest rates among the provinces, followed by Manitoba (0.97) and Saskatchewan (0.86). British Columbia (+22 victims) had the largest increase in the number of firearm-related homicides among the provinces. In 2017, more than half (53%) of the province's homicides involved firearms, 68% of which were known or suspected to be gang-related. The rise in firearm-related homicides in British Columbia was the result of increases in Vancouver (+7 victims), Abbotsford–Mission (+4 victims) and non-CMAs (+10 victims). Despite a decline in the total number of homicides in 2017 (-4 victims), Toronto, Canada's largest CMA in terms of population, reported the greatest number of firearm-related homicides with 58. This was 7 more than the previous year and accounted for 63% of all homicides reported in Toronto. Although Toronto had the highest number of homicides, Thunder Bay (5.80) had the highest rate among Canada's CMAs. The national increase in homicides committed with a firearm was also reflected in rural areas, where the rate rose 60% from the previous year. Canada's firearm-related homicide rate was 16% higher in rural compared with urban areas with rates highest in Alberta, Manitoba and Nova Scotia. Together, these provinces accounted for 50% of all firearm-related homicides in rural areas. In 2017, 63% of firearm homicides in urban areas were committed with a handgun. In rural areas, 66% involved a rifle or shotgun. Based on population projections, Aboriginal people (also known as Indigenous peoples) accounted for about 5% of the overall population in Canada in 2017, but they represented 24% of all homicide victims. The homicide rate for Aboriginal people increased 8% from the previous year to 8.76 per 100,000 Aboriginal population in 2017. This rate was six times higher than the rate for non-Aboriginal people. Across Canada, there were 156 Aboriginal homicide victims in 2017, up 15 from 2016. Female victims accounted for two-thirds of the increase, while male victims represented the remaining third. Following a sharp decrease in the previous year, the homicide rate for Aboriginal female victims (4.22 per 100,000 Aboriginal population) was up 32% in 2017. By comparison, the homicide rate for Aboriginal male victims (13.40 per 100,000 Aboriginal population) rose 2% in 2017. This rate has been increasing steadily since 2014. The homicide rate for Aboriginal males is over three times higher than the rate for Aboriginal females. In 2017, the rate of Aboriginal people accused of homicide was 12 times higher than for non-Aboriginal people. This was similar to previous years where the rate was at least 9 times higher for Aboriginal people than for non-Aboriginal people. The data presented in this article are drawn from the 2017 Homicide Survey, which collects police-reported information on the characteristics of all homicide incidents, victims and accused persons in Canada. The Homicide Survey began collecting information on all murders in 1961 and was expanded in 1974 to include all incidents of manslaughter and infanticide. Although details on these incidents are not available prior to 1974, counts are available from the Uniform Crime Reporting (UCR) Survey and have been included in the historical aggregate totals. The term "homicide" is used to refer to each single victim of homicide. For instance, a single incident can have more than one victim and for the purpose of this article, each victim would be counted as a homicide. The long-term homicide trend excludes the 329 victims killed in the Air India incident that occurred in 1985. There are cases where homicides become known to police months or years after they occurred. These incidents are counted in the year in which they become known to police. New information pertaining to the detailed information on homicides that have already been reported to Statistics Canada is updated annually as is information on accused persons. Due to revisions to the Homicide Survey database, annual data reported by the Homicide Survey prior to 2016 may not match the annual homicide counts reported by the UCR survey. Data from the Homicide Survey is appended to the UCR database each year for the reporting of annual police reported crime statistics. Information on persons accused of homicide are only available for solved incidents (that is, where at least one accused has been identified). For incidents involving more than one accused, only the relationship between the victim and the closest accused is recorded. Urban areas include police services in census metropolitan areas (CMAs) and census agglomerations (CA). Rural refers to all areas outside of CMAs and CAs and includes rural areas and small towns. For the purposes of the Homicide Survey, Aboriginal identity includes those identified as First Nations persons (either status or non-status), Métis, Inuit or an Aboriginal identity where the Aboriginal group is not known to police. Non-Aboriginal identity refers to instances where the police have confirmed that a victim or accused person is not identified as an Aboriginal person. The Juristat article "Homicide in Canada, 2017" (Catalogue number85-002-X) is now available. The "Infographic: Homicide in Canada, 2017" (Catalogue number11-627-M) and data in the "Canadian Community Crime Tracker" (Catalogue number71-607-X) are also released today.